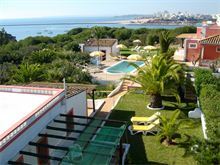 We are very pleased to be able to offer this unique property situated mid way between Carvoeiro and Ferragudo. Raised up above Praia Grande beach Casa Rosa consists of two separate cottages with a pool and fabulous uninterrupted sea views. Set in completely pirvate grounds surrounded by shrubs and woodlands yet no more than 200m down a private pathway to a fabulous long sandy stretch of beach. 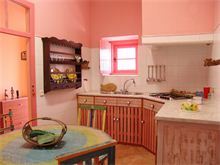 The artistic owners have carefully decorated each cottage in a simple rustic style with colourful, mood lifting, pastel shades. With nothing between you and the sea other than natural terrain, walking down to the beach almost gives you a 'Robinson Crusoe island' type sensation! Yet a 15 minute stroll along the waters front brings you to the fishing village of Ferragudo with simple quay-side restaurants offering catch of the day and traditional barbecued sardines at bargain prices! 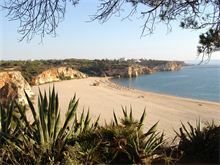 If you venture away by car, Carvoeiro, Praia da Rocha and Portimao are all within a short drive. Approximately 2kms from the shops at Ferragudo. 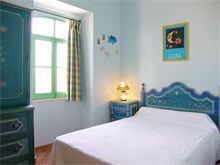 In peak season Casa Rosa can be rented for up to 8 people using both cottages. Outside peak season it is possible to rent just one cottage for up to 5 people at a reduced rate with the other cottage remaining empty and locked off. 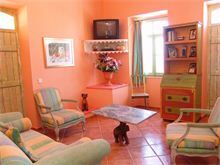 Cottage 1: Entrance from a covered terrace, 2 double bedrooms and 1 single bedroom, 1 shower room. Lounge with air conditioning, ceiling fan and satellite TV. Cottage 2: Entrance into hall, arch and steps to lounge with satellite TV and air conditioning, door to a covered dining terrace, 1 double bedroom and 1 single bedroom, 1 shower room. Steps down to the kitchen with doors to the lower terrace. Maid service 2 times per week. Car hire essential. This is our second holiday at Casa Rosa. We love it's rustic simplicity, the hand painted furniture and interior decoration. It's remote, with acres of land and woods around it. A five minute walk through the woods brings you down onto the most beautiful unspoilt beach, with amazing rock formations, soft sand and waves rippling into the shore. The views from the villa are incredible, overlooking the sea and with stunning sunsets to enjoy most evenings. Suitable for children too. No wi-fi which we embraced - great to get us all away from 'the office' and the Internet and back to enjoying a good book and to spend time talking! A deli & patisserie in the village have all you need. Walk along the beach for a drink or meal at the beach bars (Club Nau, our favourite with live music most nights). I hope you enjoy your time there as much as we do. Superb location. The ability to walk down to the wonderful beach is a major bonus of the property plus the views from the property are stunning. Our party consisted of 8 family members aged 6 - 68 years. The location is superb with wonderful views of the sea and the sunsets. The garden has a large grassy area where the children (and adults) played football and ball games. We appreciated the large covered terraces around both houses and the barbecue which we used on the evenings when we didn't stroll along the beach or drive to the many restaurants in town. The maid and pool service was excellent. Everyone had a great time. We were all sorry to leave and hopefully we will be back again next year. Amazing villa with a great location, great value for money the website is definitely worth a look when planning your next holiday! Old style villa which possibly had been a farm house with very high ceilings, 100 yards from the main road, along a track. You are in the middle of a wooded/fruit area - oranges, lemons, plums, figs etc. Close to the beach down a track/foot path - sandals are suitable - within easy walking distance of a dozen restaurants. The maid & pool chap were very good. Pool heated when sun shines!! As there were only two of us we had a great relaxing holiday. Would definitely consider going back.